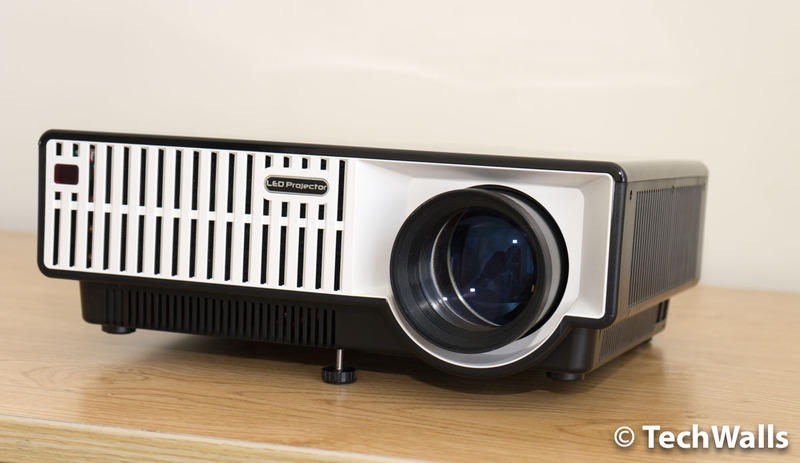 Projectors used to be an expensive gadget that people wished to have in their home theater. You had to cash out thousands of US dollars to purchase one. A lot of things have changed in the last decade when projectors are widely used in schools and businesses. The result is that we’re seeing a lot more affordable projectors on the market, and we can easily bring home a projector now. Even when you have a low budget of just $200, you can buy a projector with decent specs. 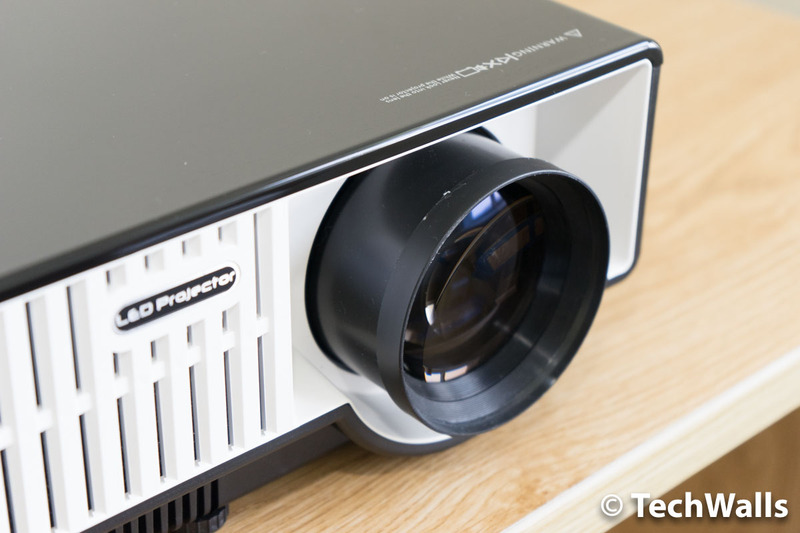 Today, we’re checking out the PRW330 LCD Projector. The PRW330 is actually the first projector I’ve ever used at home. I’ve used some previously at school and my workplace but I had little chance to really test them because they are mounted on the ceiling. Take the projector out of the box, you will also find some accessories like the remote control, a power adapter, a VGA cable, and an RCA cable. The projector is bigger and heavier than I imagined. On the front, there is just a lens with a protective cap. The lens can be adjusted to change the focus plane so that your image looks sharper. Besides, there is a filter behind the front panel. You can remove the filter from the bottom of the projector. It is recommended to clean the filter once a month to prevent overheating. All connections are located on the back of the projector. 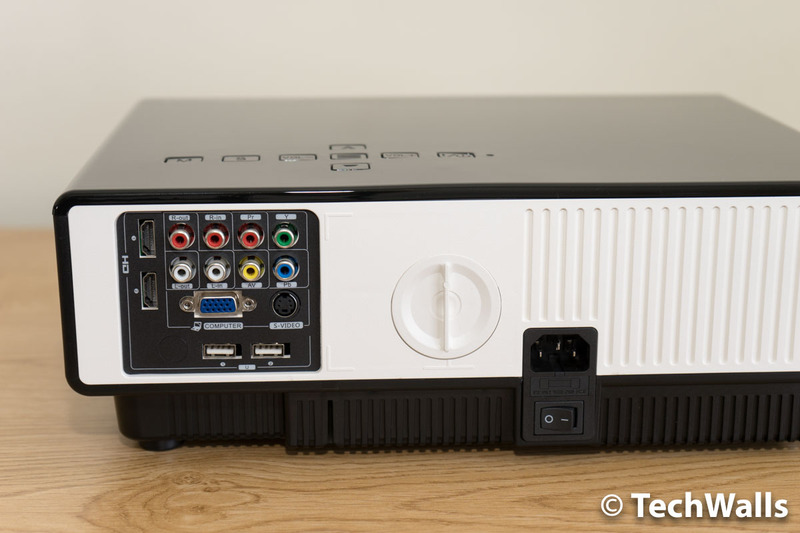 You can see the power port, 2 HDMI ports, RCA jacks, a VGA port, a S-Video port and 2 USB ports. Besides, there is a physical dial for keystone correction, this is helpful when you project to the screen from an angle and see a distorted image. Notice that this is for vertical keystone correction only, you will have to move the projector left or right to correct horizontal keystone distortion. There is no lens shift feature as well, therefore, the projector is not really flexible in positioning the image. There is just an adjustable leg on the front to position the image a little higher. The limitations are understandable because this is a budget consumer product. 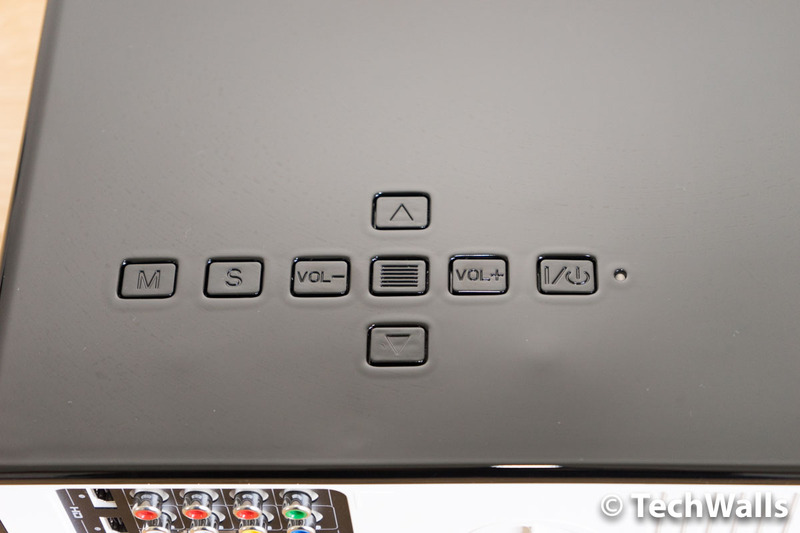 All buttons are placed on top of the projector, however, I hardly use them because using the remote control or a wireless mouse is a lot more convenient. Notably, the PRW330 is powered by Android 4.4 Kitkat. Although this is a very old version of Android, it is still very useful on a projector. Basically, it will allow you to install any Android app or game on the projector. 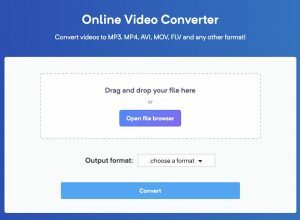 That means you don’t have to connect this projector to any other device, you just need to connect to your Wi-Fi network, then watch videos on Youtube, HBO Now, or play movies from your NAS or local storage. I streamed 1080p movies from my Synology NAS without any issue. I can run all apps on this projector but it can become slow and unresponsive occasionally. This happens even when I do some simple actions like scrolling down a web page or browsing Youtube videos. I expected the behavior because it uses the low-cost quad-core Cortex A5 processor and 1GB of RAM only. 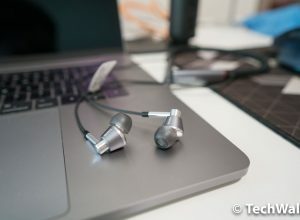 As the processor is not really fast and reliable, you might want to connect it to a computer, laptop, game console or other media players. You can also cast your iPhone or Android screen to the projector but don’t expect to see a smooth video or gameplay. I used Miracast to connect my Android phone to the projector but the image is pixelated terribly. 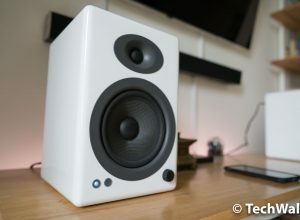 The projector has a built-in speaker and it’s quite loud, however, you should use an external speaker instead if you want to enjoy your movies. The specs of the PRW330 are quite impressive with the contrast ratio of 3000:1, the brightness of 2800 lumens, the native resolution of 1280 x 800 pixels and the maximum resolution support of 1080p. 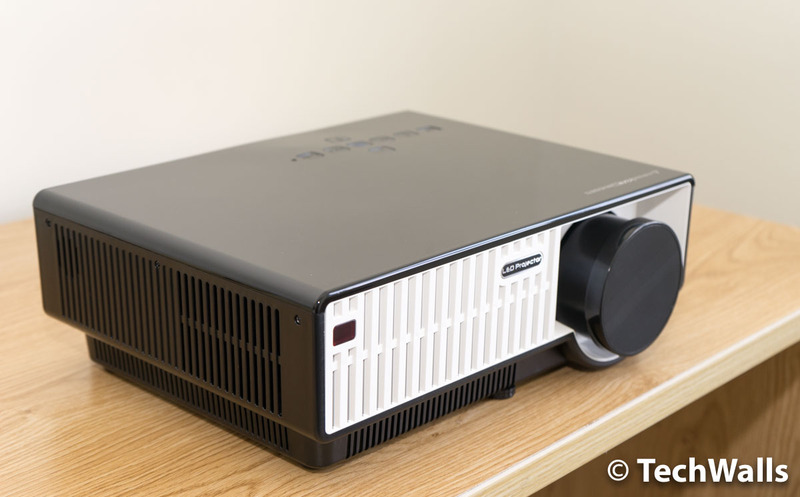 If you buy a projector with similar specs from established brands, you will likely have to pay twice the price. The ad of the product states that it features ultra-high brightness in day or night time, however, this is not true at all. I hardly can see the image clearly during daytime, you’d better use the projector in dark rooms only. Check out the video below to see its image quality. I projected the videos directly onto the wall without any screen. The image quality of this projector is not as great as some high-end projectors but it’s totally acceptable for the price. If you don’t mind a slightly washed-out color and pixelated image, this is still a good investment. The PRW330 LCD Projector is not a good choice for people obsessed with pixels. However, this is still a decent product for the price. We recommend the product if your budget is set at just around $200. I have just bought this one and with my old Hitachi I hung it upside down with a ceiling bracket but it displays the pictue upside down with no button to alter the pictue to turn it aeound. I presume the one you had in a classroom was right way up on a tray near the ceiling. Brfor I bought the PWR330 I checked and it said it has a facility for ceiling mounting. Yes ir does four insers for screws but obviously no control to alter the picture! I remember there is a screen orientation setting in the menu. Please check again. 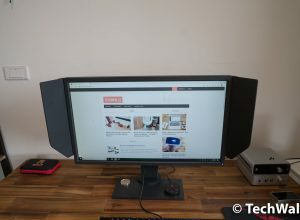 Or if you connect it to your computer, you can easily flip the image in the display settings. Yes found it I think they call it Rotate! Thank you for your prompt reply. Tuan Do, How do I alter the brightness and contrast please. It appears to be automatically set as I’ve been right rhrough the menu. thank you very much. But I can not see which icon is pressed on your phone. In the video in the second 10.
ok I saw it, thanks it is smart view. but the projector still cannot recognize my phone. HI, I just bought this and plugged it in, but there is no life sign. Are there any hidden buttons I haven’t seen or is the Projector DOA? Have you tried the switch on the back below the power port? Yes. I plugged in the cable. Turned on the switch and then tried the buttons on top. No reaction :( Probably a bad product and the shop will send a new one (crossing fingers).